Creating a prayer place in your home is easy. It’s a great way to establish the habit of praying every day. Having a prayer place in your home is also convenient. And it provides privacy for your prayer times. Having a prayer place in your home creates space where you can place your whole attention on God. You learn to hear God’s answering thoughts more clearly. It helps you leave the stress and worries of the “here and now” enables you to enter into God’s loving presence. Your home prayer place offers a safe space for you express your emotions away from others. You can meditate more deeply on your life. You can praise God freely. You can confess and receive forgiveness. And you can receive God’s direction for your life. Here are some ideas on creating a prayer place in your home. One: Look for a distraction free place when creating a prayer place in your home. Noise is a huge distraction to prayer. Noise can come from many sources – people talking, televisions, stereos, computer games, pets, ringing phones. When creating a prayer place in your home, look for a place where there are doors that can be closed between you and potential sources of noise. Also, look for times of day that the potential of noise might be less, such as early in the morning before other arise. As an example, when my children were in school, I sat down in my prayer place at home at around 9 AM when everyone was gone for the day. Using earphones with meditative music is another way to mask out noise. Just make sure that the music is instrumental and serene. Try not to use an identifiable tune that will cause you to mentally think about the lyrics rather than praying. Visual distractions. We close our eyes while praying to block out seeing things that will distract us. What you see right before you start praying can be distracting. You might be distracted by a reminder of things you need to do. The room you’re in might need cleaning or fix-up. You might see an office desk full of papers. When creating a place of prayer in your home it’s good to avoid these types of visual distractions. Interruptions are also a big problem to prayer. Nearly anything can interrupt your prayer time. It could be people or pets. Or phone calls, text messages and emails. Someone might knock on your door. You can even be interrupted by bees or buzzing flies that have made their way into your house! When creating a place of prayer in your home, remember to create a buffer zone between yourself and interruptions. One of the easiest ways is to silence your cellphone and leave it in another room. You also may need to kennel pets. Tell others in your home that you will be praying in a specific place for a specific length of time. Tell them to avoid interrupting you unless it’s something urgent. When pets and other people see you sitting quietly in a chair praying, you look like you’re not really doing anything important. They see it as invitation to interrupt you. Your prayer place in your home needs to be comfortable. If you want to sit while praying, find a comfortable chair. I like to sit in an upholstered rocking chair while praying. Being comfortable adds to my feelings of rest and refreshment and helps me linger a little longer. No need to buy anything – you can simply designate a chair or an end of your sofa as your prayer seat. You might like to kneel when they pray. The traditionally, people have knelt beside their bed to pray. In the Bible, Daniel knelt by an open window to pray. Kneeling on the floor is hard on my knees, so I’ve found that when I want to kneel a wing back chair is the perfect place. I kneel on the seat cushion and prop my elbows on the high back of the chair. Other people sit in a chair pulled up at a kitchen table to pray, resting their elbows on the tabletop. Still others prefer praying on the floor, sometimes using pillows for extra comfort. Just make sure you don’t pick a place that’s too comfortable! I’ve discovered that it’s probably not the best idea to have prayer time lying down in bed at night before falling asleep. I fall asleep before I’m halfway through! When creating a prayer place in your home you can use any space that works for you. I mentioned that I sit in an upholstered rocking chair. This chair is in a small formal living room that’s not used for other daily purposes. Your prayer place could be anywhere inside or outside of your home. Don’t overlook spare bedrooms and closets. One of my friends created a literal prayer closet in her guest bedroom closet by adding a small stool. Another friend uses a large leather chair on a glassed-in porch. At our beach rental house, I chose a settee tucked away in a hallway under the stairs as a prayer place. One woman I know uses her bathroom as her “prayer closet.” She can go in there and shut the door and others wouldn’t disturb her. She kneels down by the tub to pray! Another person I know uses a screened gazebo in their yard. You could use a chair on your apartment balcony or a bench in your yard in a flower garden or by a creek. If you’re using an outdoor prayer place, make sure you have an alternative place to use when the weather is bad. Historically, wealthy people often built a formal private chapel in their castle or palace. On the other hand, slaves who were forbidden to pray by their masters secretly prayed with their heads in empty pots or washtubs so they could pray out loud without being heard. Resourcefulness counts. As an example, on a mission trip to Russia we were staying in a Russian apartment that had a small outdoor balcony that was glassed in on both sides. I could sit there away from other team members for personal prayer time. On another mission trip to rural Honduras I adopted a prayer place standing under a huge native tree. Your home prayer place doesn’t even necessarily have to be in your home or your yard – it could be in your car or truck. When things are hectic in her home, one woman I know sometimes goes out into her garage and prays in her parked car. Others pray in their car for a few moments once they’re parked in the office parking lot. Others drive to a scenic spot to pray inside their car. Please note that there’s a difference between praying in a parked car and praying while driving. Praying while driving is praying on the go, which I call pathway praying. It’s another great way to pray but doesn’t allow the same kind of concentration on God because you have to keep your body and mind engaged in what you’re doing. In your home prayer place you can either pray out loud or silently. If you want to pray out loud, make sure your prayer place has the privacy you need. If your prayer place is in a parked car or outdoors where someone might see you, try this trick. Hold your cellphone up to your ear and talk to God as if you’re having a phone conversation. Four: Ideas for prayer aids in your prayer place in your home. Another great advantage of having a designated prayer place in your home is that you can keep prayer aids close at hand. 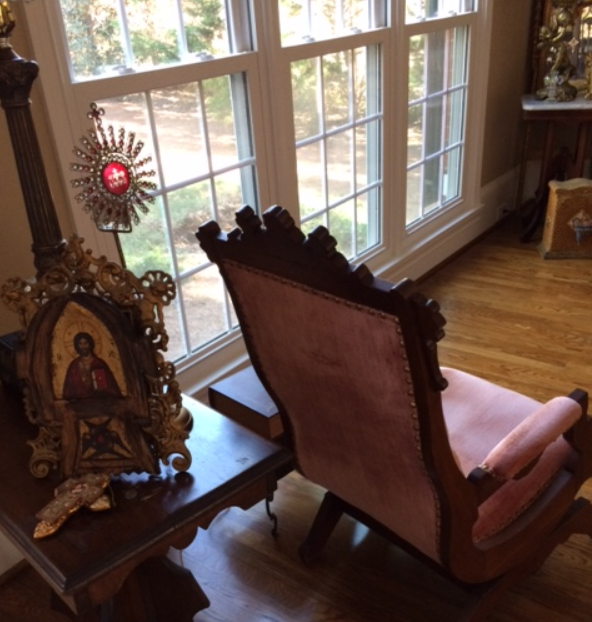 As an example, I purchased a decorative box with a hinge that I keep on a stool next to my prayer chair. Inside is my Bible, my drugstore reading glasses, a pen and pieces of paper with prayer reminders and assignments on them. Keeping an extra pair of reading glasses keeps me from having to go off in search of glasses every morning. Here are some useful items you might consider having in your prayer place in your home. Most people keep their Bible in their prayer place in their home. Reading passages from your Bible adds power to your prayer times because it helps you know more about God. It gives God’s promises you can pray and claim. It also helps you become familiar with God’s voice so you can recognize His answering thoughts. Many people use devotional books during in their home prayer place. Daily devotional books usually have a short, three minute reading with a Scripture, a personal thought or experience and a prayer. Others are written as if God were speaking to us. Others may be collections of prayers for your life situation, such as a devotional book especially for parents. Hymns and music can be a great addition to your home prayer times. You can listen to Christian music, sing or play music or read the words to songs from a hymnal. I picked up an old hymnal at a garage sale one day and decided to put it with my devotional materials. Every day I read the lyrics to an old hymn. You’d be surprised how inspiring and instructive the words to old hymns can be. They can help you move away from your earthly thoughts towards God. My friend with the guest room closet prayer place keeps a prayer journal in her prayer place. 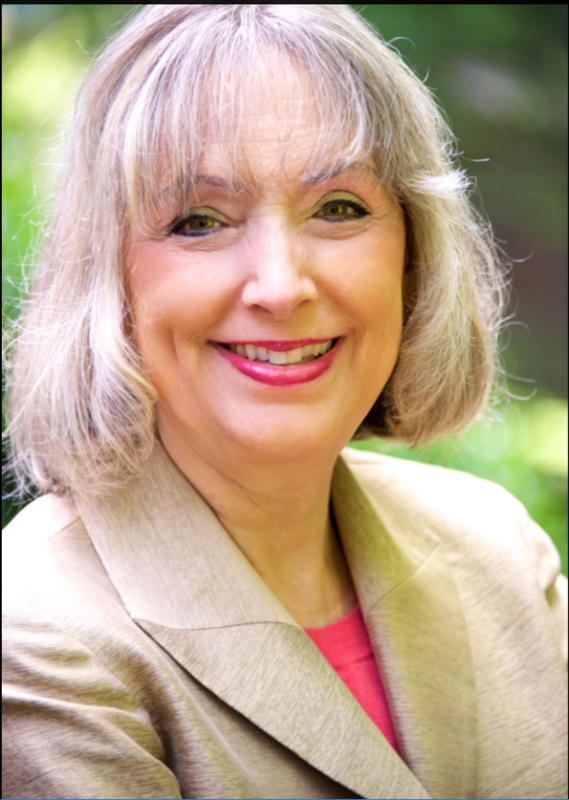 In it she writes down prayer requests, answers to prayer and thoughts and ideas God might send her. 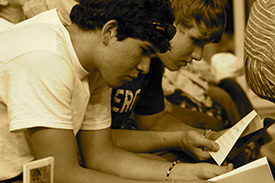 Other people use prayer journals to write out their feelings, thoughts and ideas in prayer form. It helps gain clarity and new insight into life. I use a prayer journaling method where I write down and number prayer answers instead of making a long list of requests. This keeps me focused on what God has done in my life. It gives me encouragement that He has been there in everything that has happened. One of my friends loves beautiful words and poetry. Her side table by her prayer chair is full of books of inspirational poetry and quotes on prayer. 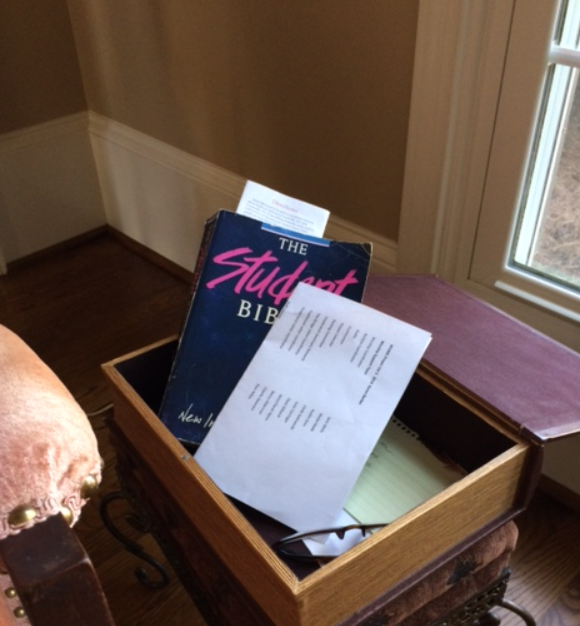 Others keep a Book of Common Prayer in their home prayer place. Or you might have a lectionary book that covers the whole year in prayer and Scripture. You might read a passage or a chapter from a classical Christian book such as the Practicing the Presence of God by Brother Lawrence. Or you might choose a book that deals with a Christian topic such as praise or God’s will. There are a variety of other prayer aids that you might want to include in your prayer place in your home. You might create a daily prayer calendar to keep up with prayer requests. Or you can use a printed prayer calendar provided by a missionary group. Christians also use prayer beads to keep track of their prayers. Electronic devices can be used as a resource in your prayer place in your home. You might use a Christian meditation phone app. Some people use the timer function on their phone to set a specific amount of time for meditation. 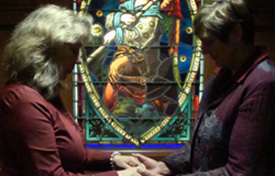 Or you can find online prayers on websites such as prayerideas.org. Creating a visual prayer focal point in your home prayer place can further enhance your feeling of sanctuary and help you focus in on God. Visual prayer focal points are usually items that remind you of God’s presence. Here are some ideas of visual items you might want to add to your home prayer place. 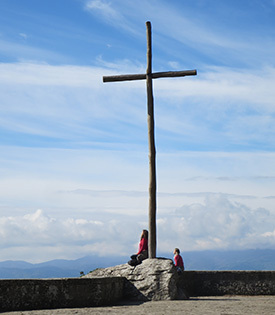 Cross or crucifix A cross or a crucifix is the most prevalent visual prayer focal point. In photos of the most austere cells of nuns or monks you will always find a crucifix on the wall. There’s room for a cross or a crucifix in even the smallest home prayer place. It doesn’t necessarily have to be hung on the wall. You can keep a small, hand-held cross with your Bible. You can also purchase a cross especially designed to fit the contours of your hand as you hold it. I personally have a variety of crosses in my home prayer place. I have a crucifix in a candle holder and a large metal cross. Anything you have inherited that speaks about your faith history can be a wonderful addition to your home prayer place. As an example, I inherited a small, tattered, palm sized book of Psalms that belonged to my great grandfather. I keep it in an old china closet in the living room. On top of the book I keep an ancient pair wire rim glasses that belonged to my great-grandfather. It helps me image him reading the Psalms. And it helps me remember those who have come before me in the faith. People have long been drawn to statues and figurines that help you visualize Jesus, Mary and Joseph and other saints. They give you a sense of the reality of the person and how they lived. Often the postures and gestures of the statues tell us about their relationship with God. As an example, statues of Mary often show her with her head bowed in reverence and her hands folded in prayer. It reminds us of how she said yes to God and followed his will. Religious statues can also show us the things about Jesus. I was given a statue of Jesus carved out of olive wood when my in-laws visited Jerusalem. Jesus is carrying a lamb in his arms and has a staff in his other hand. This shows Jesus as the Good Shepherd. It reminds us of the beautiful Scriptures where Jesus told us how much he loves us, cares for us and seeks us like a good shepherd. Religious artwork has been used for centuries as a way to bring us into God’s presence. Most of us can’t afford original art, however we can afford prints and copies that speak to our souls. You can also order posters in all sizes online of famous works of Christian art. Some people like to visit museums and churches to explore artwork. Often you can b ring home a photo, print or postcard of something you really liked. As an example, icons are a traditional type of Christian art. Each is highly symbolic, stylized and painted with prayer. I purchased a reproduction of an icon of Christ praying in the Garden of Gethsemane while in Romania. I have it displayed in my living room prayer place. Another time I found a collection of old Sunday school children’s prints that were used as teaching posters. They were two dollars each that told different Bible stories like Jesus blessing the children. One of the few original works of art I have was purchased for a few dollars at a garage sale. It is a hand carved sculpture using a lump of coal. It shows Jesus comforting a keeling coal miner whose long sideburns were popular in the 1970s. Such items can be used during your home prayer time for meditating using art. Photographs can be used as a focal point when creating a home prayer place. They don’t necessarily have to be religious photos. They could be photos of your loved ones for whom you are praying. They could be a photo of a special religious event, such as a baptism. 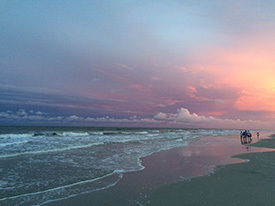 They could be a photo of a church or a place of beauty where you have felt close to God. 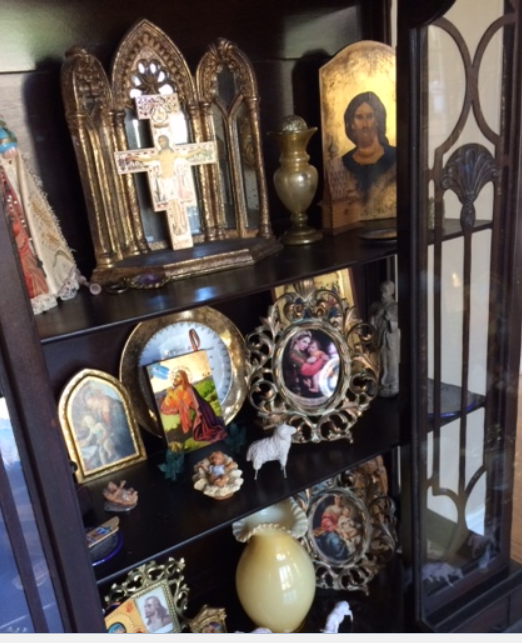 If you enjoy collecting, you could use religious items and souvenirs as a prayer focal point. Some people like to collect different kinds of crosses. Others collect angels. Some collect small manger scenes. Others collect icons. As I mentioned, I keep a variety of collected items in an old china closet in my living room. I have family mementos, angels, icons and souvenirs from mission trips. I sometimes notice one item individually when I sit down for my prayer time. Other times, I see them as a whole which helps me see faith through the eyes of many different people from different periods of history. You may be surprised to find that things you already have on hand can be grouped together as a collection. If you’d like to start a collection, it doesn’t have to be expensive. You can find items in your attic or you might have things passed onto you by relatives. You might find things at a garage sale. Or people might enjoy giving you gifts to add to your collection. Plaques that have Bible verses or a few words of faith on them are effective visual prayer reminders and focus points. They can only have a few words such as “Amazing Grace” or “Be still and know…” (Psalm 46:10) Or they can quote longer passages, such as the Lord’s Prayer or the 23rd Psalm. They can also quote lines from hymns or songs or they may quote saints or famous poets. Religious plaques can be found many places such as Christian bookstores, craft stores or home décor stores. Or you if you enjoy crafts, you can create your own. Symbolic items can also be used as a visual prayer focal points. As an example, you might have a globe in your home prayer place if you often pray for world concerns. Or the symbols might be more persona, such as things that remind you of an answer to prayer. As an example, a friend has a small framed handwritten note that has a salary figure written on it when she was hired for a new job. It was the exact amount of money she needed to pay her son’s tuition. In some denominations of the Christian church people create a home altar. I have seen home altars that are a shelf on a wall. Others are a small table. They usually have a religious statue or a picture, a cross and candles. These are often used as private places of family worship or personal devotion. In some cases there might be a small kneeler at the home altar. Incense also is sometimes used according to the rituals and customs of different Christian denominations. Candles are used in Christian worship to symbolize Christ as the light of the world. They are used in private prayer in sanctuaries where intercessors light a candle to symbolize their prayers being offered to God. Candles can be lit to begin your prayer time. They also might be lit to symbolize a special request you are making or a person for whom you are praying. Candles of any size may be used. The most popular are votive candles where the candle burns inside of a small glass. You can also use battery operated led candles if safety is a concern. Flowers can be used in your prayer place in your home. Some people use artificial flowers. Others prefer to use fresh flowers. When creating a prayer place in your home you can also use seasonal décor as a visual prayer focal point. The most popular times are Christmas and Easter. For Christmas you might create a special display in reflecting the Biblical story of the birth of Christ. Here are some seasonal ideas for the four seasons and an idea for creating a Christmas prayer focal point. Throws or prayer shawls can be used when creating a prayer place in your home. As an example, you might have a throw with the words of the Lord’s prayer written on it. I found one at a discount store with an angel on it. Another had a manager scene. They can be used to wrap yourself when you are praying to symbolize God’s loving arms enfolding you. Our church has a comfort blanket ministry. After each blanket is made, it’s prayed over and given to a person in need of God’s care. You could keep a comfort blanket in your home prayer place and pray over it until God directs you to give it to someone. Another prayer shawl ministry sews yarn strands onto a small quilt. After you say a prayer, you tie another knot in the strand. After the knots are completed, the blanket is given to the individual who has been prayed for. Cards you have received from others can also be used to create a prayer focal point in your home. Cards of encouragement, get well cards and postcards from religious sites can be displayed in your prayer place. As an example, on my travels I purchased ten post cards that were attached to each other all showing different masterpiece paintings of Mary and baby Jesus. I purchased inexpensive frames and prop them up in my home prayer place during the Christmas season. If you are creating your prayer place in your home in an area that’s fairly private, such as a closet, you can use a small bulletin board or whiteboard. You can write or post prayer requests and answers. This can be a great way to remember things you want to pray about. And it can prove to be a great encouragement when you are able to see God’s answers.